Your RFID reader is connected to your antennas, you’ve adjusted your power settings, and you’ve applied your RFID tags to the items you want to track; however you’re having trouble reading your tags. 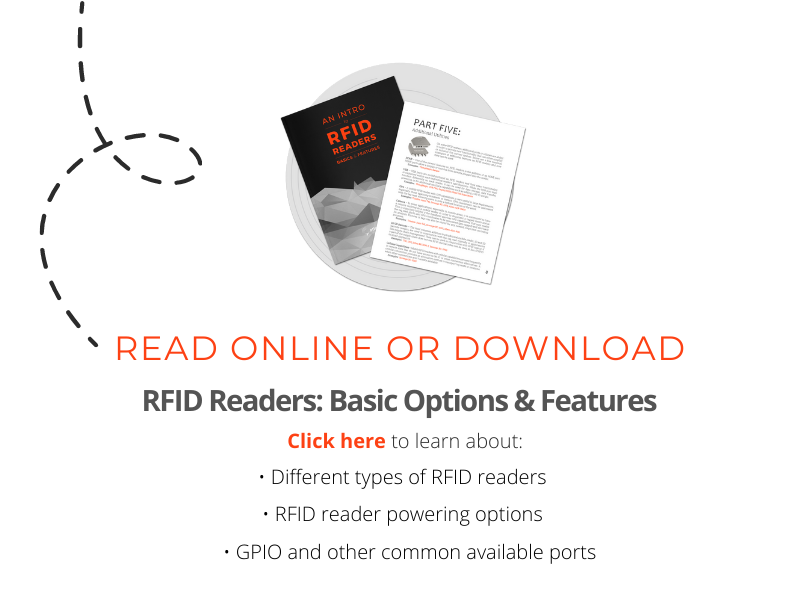 Well, you’re in luck because this post will help you troubleshoot some of the common RFID read range pitfalls. Before delving into the topic, the importance of testing cannot be stressed enough. Regardless of what is stated here, you should always thoroughly test, make any necessary adjustments, and then retest. Some hardware is designed for maximizing read range, while other hardware is designed to limit read range. It is important that you have the appropriate hardware in place for your application. The following six tips walk you through key hardware specifications that will assist you in determining your optimum setup. If you need more read range, use higher gain antennas. If you need less read range, use lower gain antennas. If you need to read tags up close, use very low gain proximity antennas. The details: Simply put, a higher gain antenna increases the power received from the reader. If you want to make sure your antennas have a longer “reach,” then you need high gain antennas (e.g. 9 dBi, or higher). This begs the question, “why would I want a low gain antenna?” Some environments and applications require a tightly controlled configuration. For example, in systems where the tag will always be the same short distance away from the antenna, a high gain antenna simply isn’t needed. In others, you many require a proximity scan so as to not read tags too far away and a low gain proximity RFID antenna is perfect for such a situation. In short, the higher the gain, the higher the range of the antenna, and vice-versa. Additionally, lower gain antennas are smaller in size than high gain antennas; so, if your application has size restrictions in terms of the antenna’s dimensions, you may want to experiment with a lower gain RFID antenna. If tags are aligned with the antenna’s polarization, linear polarized antennas will read farther than circular polarized antennas. If tags are not aligned with the antenna’s polarization, then circular polarized antennas will read farther than linear polarized antennas. The details: Polarization refers to type of electromagnetic field the antenna is generating. Linear polarization refers to radiation along a single plane. A very simple way to think of a linearly polarized RFID antenna‘s beam is to imagine swinging a sword straight up and down or side to side. Circular Polarization refers to antennas that split the radiated power across two axes and then “spins” the field so as to cover as many planes as possible. A simple way to imagine a circularly polarized RFID antenna‘s field is to imagine a “tornado” emitting from surface of the antenna. Due to the nature of the antenna’s field, tag orientation becomes much more important with linear antennas than with circular antennas. Additionally, because the power is not split across more than one axis, a linear antenna’s field will extend farther than a circular antenna with comparable gain, thus allowing for longer read range when aligned with the RFID tag. See our article further explaining circular vs. linear polarization. As a general rule of thumb, small tags will have shorter read ranges, and large tags will have longer read ranges. In order to get the best range from any RFID tag, make sure that the tag is fully facing the antenna and pay particular attention to tag orientation when using linearly polarized antennas. Lastly, when tagging objects with high liquid or high metallic content, be sure to choose RFID tags designed for mounting on such objects. Tag Size: Passive RFID tags can vary in read range from a few inches to 50+ feet. RFID tags contain antennas and because larger antennas will broadcast farther than smaller antennas, generally speaking, the larger the tag, the longer the read range. Tag Orientation and Read Angle: In order to explain the tag orientation and read angle, picture an RFID tag lying flat on a stool. Then, picture an RFID antenna on the ceiling facing downward above the stool. In this scenario, you can move the tag in two important ways and both have major ramifications on read range. Rotating the RFID tag on the stool (tag orientation): To clarify, this point only matters for antennas with linear polarization. If you have a circular polarized antenna, the tag’s orientation shouldn’t matter. However, with linear antennas, tag rotation (i.e. orientation) does matter. Imagine that the seat of the stool is a clock face. With a linear antenna, if the tag is oriented from 9 – 3 and you aren’t picking it up, try rotating it to 6 – 12. This is a quick test which mainly applies to tags with a single dipole (e.g. the Alien Squiggle). Some RFID tags have dual dipoles which will help mitigate problems caused by this movement (e.g. the SMARTRAC Frog). Flipping the RFID tag onto its side (read angle): Reading any RFID tag from angle (vs. straight on) will have a negative impact on read range. In order to harness the most energy possible from the RFID antenna, the RFID tag should directly face the antenna. To illustrate this point, think of 19th century naval warfare. In this scenario, the RFID tag is a smaller gunship, and the RFID antenna is a bristling 140 gun, four deck ship of the line with Lord Nelson on board. The antenna needs to broadside the tag so that Lord Nelson can effectively wreak havoc on the tag. If you are more math minded, and you don’t care for the naval analogy, think of the antenna extended as an X,Y plane, and the tag (aligned with the antenna) also extended as a X,Y plane. The two are separated by some Z distance, and they never touch. In short, you’ll get the best range when you read the tag face-on – the steeper the read angle, the more the read range will decrease. Some RFID tags, such as the embeddable RFID wire tag, have a 360 degree read profile which mitigate the read angle concern. Tag Placement: What you are tagging and where you place the tag is an easier topic to explain, but it is extremely important when it comes to read range. UHF RFID tags are strongly affected by objects containing metal (reflection of RF energy) or water (absorption of RF energy). If you don’t choose the right tag for the object you wish to tag, you may have greatly reduced read range or you may not be able to read the tag at all. There are metal-mount RFID tags with a special backing designed to be applied on metal (or objects containing water). These types of tags will frequently perform better on metal than they do off metal. As a general rule, unless a tag is marketed as a background insensitive or on-metal RFID tag, assume that it can’t be applied directly to metal or water filled objects. In addition to the composition of the item being tagged, each item will usually contain a “sweet spot” that will maximize the read range when the tag is placed within it. Sweet spots vary tremendously from item to item and can only be identified via testing. Higher power settings will result in greater read range, while lower power settings will result in decreased read range. Also, in order to maximize read range, ensure that your reader is set to its highest receive sensitivity. The Details: All RFID readers have the ability to control how much power they send through the cables to the antennas. Check your reader’s settings to see how much transmit power you are transmitting (in dB); the higher the number, the more you’ll increase read range, and vice-versa. It is important to note that, because the power is measured in decibels (dB), the power will double (or be cut in half) for every 3 dB you increase (or decrease). For example, 27 dB is twice as powerful as 24 dB, and 30 dB is twice as powerful as 27 dB. As a caveat, although the power doubles every increase in 3 dB that doesn’t mean you’ll double the read range. Lastly, check your reader’s receive sensitivity settings. Typically, these are set to maximum by default, but it is worth double checking to know for sure. If the reader is set to maximum sensitivity, it will report weaker tag signals (which typically come from tags that are farther away, thus increasing read range); a lower sensitivity setting will ignore the weaker signals, thus decreasing read range. Bottom line: the quickest and easiest way to maximize read range is to ensure your reader is set to its full power and highest receive sensitivity. The longer the cable, the higher the loss and using adapters and/or multiplexers inserts additional loss into your RFID system. For maximum read range, connect the antenna to the reader with the shortest cables you can get away with and don’t use unnecessary adapters or multiplexers. If you must use longer cables, be sure to offset the loss with a higher rated insulated cable. Length of cables: The antenna cables connecting the antennas to the RFID reader “leak” energy. The longer the cable, the more energy it will lose, eventually losing so much that the antenna won’t receive enough power to generate a strong RF field (regardless of the antenna gain). If you are looking to maximize read range and the RFID reader is a significant distance away from the antenna (i.e. 20 feet or more), you should look into using a cable with a higher insulation rating. If your application doesn’t call for much read range, a cable with a lower insulation rating should be okay even for longer cables. For more information on this topic, read our post on getting the most from your antenna cables. Adapters & Multiplexers: Sometimes you may need to convert the end of an antenna cable from one type to another and, for this, you’d use an adapter. However, you should note that, for each adapter used, you insert approximately another 1/3 dB of loss into your system. Multiplexers, such as the Impinj antenna hub, split one antenna cable into many, but also insert more loss into the system. The Impinj antenna hub inserts approximately 1 dB of loss. For the most part, you’ll only use adapters and antenna hubs when required, so there may be no getting around the loss (which affects the read range). What’s important is taking note of how much loss you are inserting so you can compensate accordingly in other areas to offset the loss. MANY environmental factors can affect read range. When attempting to maximize read range, be sure to account for various types of interference and test, test, test! The details: Different environmental conditions can affect the performance of UHF RFID systems. Water, metal, florescent lighting, large machinery, and competing frequencies (other radio waves) may adversely affect UHF RFID read ranges. The best way to maximize read range is to note the various possible forms of interference and attempt to mitigate that interference by testing, making changes to your system, and retesting. If you need help choosing the right RFID equipment, you can contact a sales engineer at atlasRFIDstore.com by emailing info@atlasRFIDstore.com or calling (888) 238-1155.